Photography By Jerry was created in 1977 and has been doing fine quality portraits since then. We do a large variety of photography from children's portraits to wedding photography along with High School senior portraits, as well as family and couples portraits. We also do business portraits for the business clientele, we also offer passport photos for those who like to travel. Photography by Jerry has three photographers to give you a variety of photographic styles to select from. Each photographer has their own way of portraying the subject. You can also reach us at sales@photographybyjerry.net by email. Please contact us wtih any questions about your photographic needs. 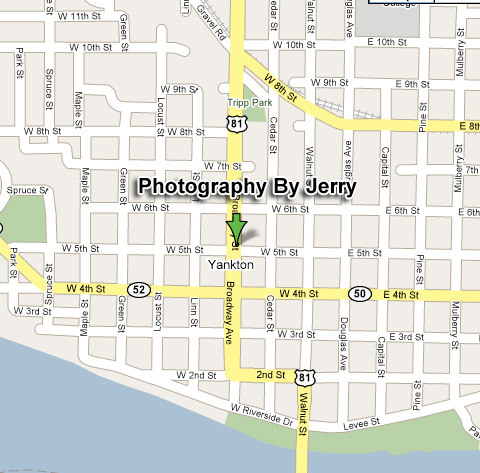 The studio is located at 508 Broadway in Yankton,S.D.